Architects: Pei Cobb Freed; Program: Office, Retail; Location: New York, NY; Completion: 2015. 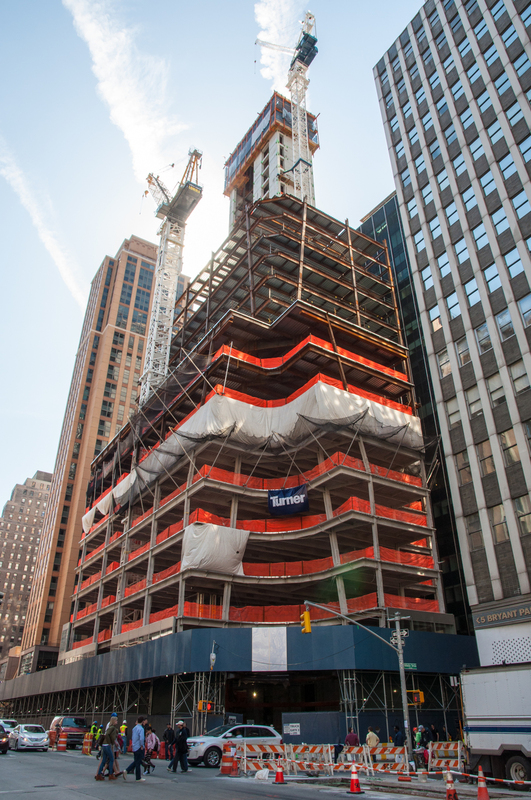 Installation of curtain wall panels has begun on the second floor of the 30-story office tower at 7 Bryant Park. The panels consist of a low iron IGU (Insulated Glazing Unit) and a linen finish stainless steel spandrel panel that will give the building a strong horizontal banding appearance when finished. The conical incisions at the corner facing Bryant Park are already apparent in the steel structure that has reached the 16th floor. This gesture culminates in the 48 foot diameter stainless steel clad entry canopy, the structure for which has already been installed on site.